The Moonsea region holds a huge amount of mineral wealth for those hardy enough to brave peril to win it. The area is infamous for its bleak landscapes, harsh winters, ravaging dragons, pirates, and rapacious local governments. 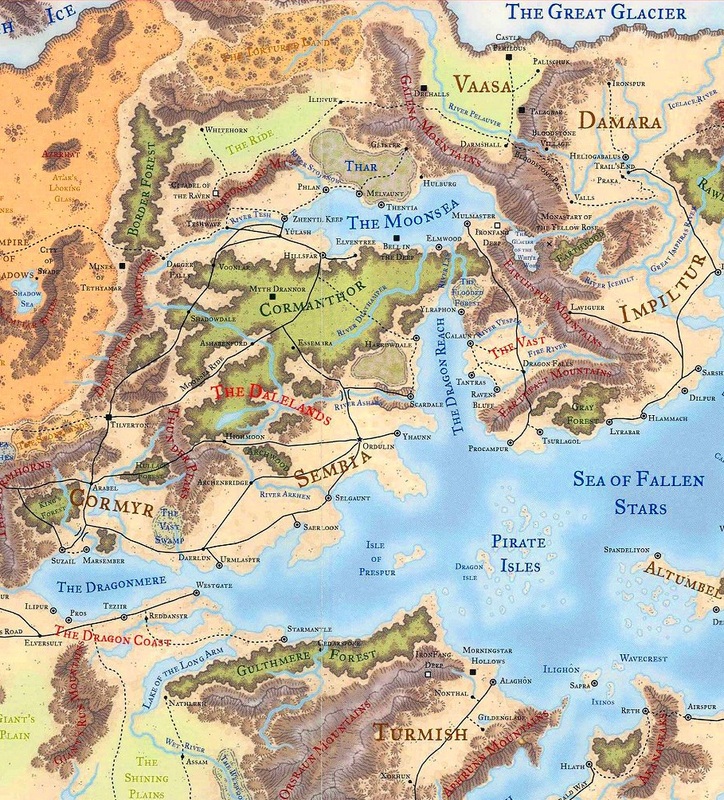 Some of the most aggressive cities in Faerun rise from the Moonsea's shores: Hillsfar, Mulmaster, and Zhentil Keep. Wherever a government exists in the Moonsea, it rules with an iron grip. Tombs, ruins, and monster lairs abound in the Moonsea, as do complex intrigues and double dealing tyrants. The battle cry of the area is well chosen: "Dare--and Beware!" Relations between the city-states surrounding the Moonsea are marked by hostility, covert treachery, and sporadic warfare. Each awaits only the proper moment to crush its rivals, but fears to attack otherwise lest its preoccupation with one enemy should provide another with the opportunity to strike a killing blow. The ruins of Hulburg, destroyed by Mulmaster, provide an object lesson for all on the penalty for failure. Trade is the lifeblood of the region: metalwork, gems, jewelry, weapons and armor are the main exports. Grain and fruit are imported from the Dalelands, while cloth and spices travel up from Sembia. Slavery is commonplace. Captured enemies and convicted criminals are sent to work in the mines, chained to the oars of galleys, or, if they are fortunate, kept to work on the estates of rich merchants. To be a rich merchant is to be a lord. Hillsfar is a large walled city on the southern coast of the Moonsea. It has a permanent population of about 40,000 people, almost entirely humans, since all other races are forbidden entry into the city. Non-humans caught within the city may find themselves placed in the Arena, and forced to fight each other, or pitted against dangerous monsters. The city is ruled by the First Lord, a wizard named Maalthiir. He wields absolute power within the city, and his word is law. He is supported by the army, known collectively as the Red Plumes, and the Rogues’ Guild, which serves as an internal spy organization. Maalthiir desires to conquer the entire Moonsea region. He has started by seizing the small town of Yulash from the Zhentilar forces that were holding it. In "saving" the town from the evil Zhentarim, his forces have virtually destroyed it. The city of Zhentil Keep is located on the western most point of the Moonsea, at the mouth of the River Tesh. It is ruled by leaders of the Zhentarim, an evil mercenary group that has attempted for many years to dominate trade from the Moonsea to the Sword Coast. Although the Black Network, as their organization is often called, wields a great deal of influence and has many outposts throughout the land, their desire for complete control remains unfulfilled. The Zhentarim will work with members of any race willing to help them achieve their ends. The leaders are primarily human, but orcs and other fell creatures hold important positions in their ranks. Zhentil Keep has suffered a number of setbacks in their quest to control the trade route from the Moonsea to the Dalelands. The first was the death of Bane, the god of strife and tyranny, during the Time of Troubles, and the ascencion of Cyric to godhood. In a city-wide purge, those Banites who refused to switch their allegiance to Cyric were either killed or driven underground, and an inquisition was launched to ferret out the unfaithful. Then, strife between Manshoon and Fzoul Chembryl, the two main leaders of the Zhentarim, resulted in the partial destruction of the city of Zhentil Keep. This coincided with the resurrection of Bane, and a counter-inquisition to purge the organization of Cyricists. All this in-fighting distracted and weakened the Black Network, and their enemies took advantage. The forces of Hillsfar attacked and captured the town of Yulash. Then, an uprising by the forces of Randal Morn, hereditary ruler of Daggerdale, forced the Zhentarim to abandon their important base in Dagger Falls. Currently, the Zhents are busy repairing the damage to their city, and planning their resurgence. Already they have forced the Red Plumes out of Yulash, although the fighting has nearly destroyed the town. It is likely that the next blow will be aimed Dagger Falls, but it may fall on some place less expected. Perhaps their most surprising and valuable coup was the negotiation of an alliance with the city of Mulmaster. Melvaunt is a large walled city situated on the north shore of the Moonsea, at the southern edge of Thar. It has a population of about 34,000 and can field an army of 5,000 swords. There is a great deal of rivalry between the merchant houses. The lesser houses are constantly vying to become Greater Houses, and indeed, House Leiyraghon achieved its current position by taking down House Natali and House Marsk, both now relegated to lesser status. Most of the houses are human families, but the members of House Calaudra have moon-elf blood in them. Prejudice against non-humans will prevent them from ever achieving Great House status, but they are otherwise accepted in the city. Mulmaster is a heavily fortified town on the southeastern edge of the Moonsea. It is the most populous city-state in the region with about 46,000 citizens. It boasts an army of 6,000 men, and a somewhat out-dated navy of 15 ships. Their most valuable fighting force, however, is a group of 200 battle-wizards known as the Cloaks. The city is ruled by Selfaril Uoumdolphin. Up until a few years ago, he had sought to block Zhentarim influence in the region. A sudden change of heart caused him to throw in his lot with the Black Network. As a consequence, he has even allowed them to construct a Banite temple in the city. This alliance is a palpable threat to the other cities of the Moonsea. Attempts to undermine it have failed, and it has yet to be met by an opposing alliance of the other city-sates. Thentia is located on the northern Moonsea, southeast of Melvaunt. It is the most open city of the area, lightly ruled by a watchlord elected by the local nobility. Although militarily weak, it is fiercely independent. Its greatest military asset is the presence within the city of a large number of very powerful wizards who value their personal freedom enough to help protect the city from invaders. Thentia is the only Moonsea city that does not allow slavery within its borders. That it serves as a safe haven for escaped slaves is a bone of contention between it and its nearest neighbor, Melvaunt. This used to be the principle city of Teshendale before that dale was overrun by the Zhentarim. It is now little more than a military base. The Zhents have a garrison of 2300 soldiers occupying the town, including a contingent of humanoids (orcs, goblins, ogres, etc). Few of the original inhabitants remained in the town, . Voonlar is a small town clandestinely controlled by the Zhentarim. It occupies an advantageous spot on the trade route between the Moonsea and Shadowdale. Elventree is a small elven village, a bare remnant of the Elven Court which once ruled all of the Cormanthor Forest. The inhabitants are primarily elves, but with some humans and half-elves. They make their dwellings in the trees, living in harmony with the forest. Elmwood is a quiet hamlet of humans and half-elves located on the southern coast of the Moonsea. The inhabitants support themselves through farming and fishing. Very little trade passes through the town, so that, although an easy target, it hasn’t much to offer an invader. Plan is a small city located on the northern coast of the Moonsea. It has been destroyed numerous times over the many years of its existence. It has seen major destruction twice in just the past twenty years. The stubborn, resilient inhabitants are busy once again rebuilding their city. The practice in the past was to fill the rubble, and rebuild on top of it, so that there are many ruins beneath the city. This has attracted a large number of adventurers in search of buried treasure. The natives do not object to the presence of these armed fortune hunters, since the ruins are often occupied by evil creatures in need of killing. Phlan is ruled by the Council of Ten, one of the few freely elected ruling bodies in the Moonsea area. Also known as the Great Gray Land, Thar is a windswept, broken moor with a harsh climate. The local ogres and orcs speak of a time when their people built a great kingdom here, but nothing is left of it now except warring tribes. Many monsters roam the land, but intrepid humans still manage to bring caravans through from the trading outpost of Glister in the foothills of the Galena Mts. Relations between the humanoids of Thar and the human towns of the Moonsea can range from uneasy cooperation to outright hostility. The humanoids are not above accepting help from humans in order to gain an advantage over rival tribes, and the humans are not above forging alliances with the humanoids in order to secure the safety of their caravans. Open war is never far away, though, as both sides are convinced that peace will never reign until the other side is wiped out. The Ride is a grass steppe that lies north of the Dragonspine Mts. It is inhabited by nomadic tribes of human barbarians. Although the tribes often engage in raiding forays against each other, they are quick to unite against foreign threats. There's no shortage of foreign threats. The city states of the Moonsea covet mineral resources in the hills along the edge of the Ride, and have established mining towns in the area. The humanoids of Thar raid the tribes of the Ride for horses and slaves, and sell any surplus to the slave traders of Melvaunt and Zhentil Keep. The Forgotten Realms Campaign Setting, p.159. The term 'Zhentarim' refers specifically to the agents of the Black Network. Not all citizens of Zhentil Keep are part of that organization, although the majority are willing to be led by it. 'Zhentilar' refers to members of Zhentil Keep's military, while 'Zhent' refers to any citizen of Zhentil Keep.